The Bonazzoli Band was formed in 2009 with a goal of wrapping the best of 20th century music into an all new sound. Founder Matthew Bonazzoli had been working for more than a decade on perfecting this sound. First with his band Gearhead which he formed in Massachusetts during the late 1990’s. 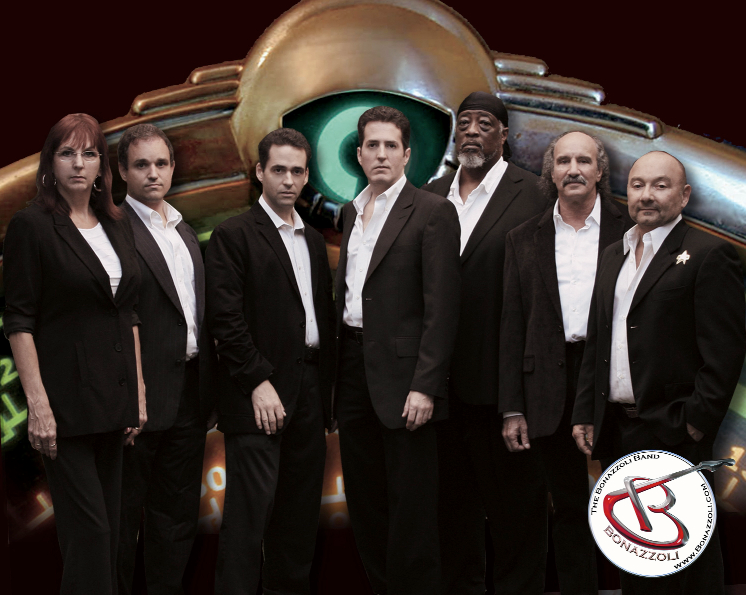 Gearhead was a mix of 50’s and 1960’s rock, pop and modern rock, and a dash of swing. This combination was a hit with audiences and the band released two albums. Dynaflow and Torqued both explored this sound in unique ways. Ultimately though, Matthew believed that the sound could still be improved upon. After a five year hiatus where he moved to Florida and composed new material to further develop the concept he had a chance meeting with a ragtime pianist named Patrick Thompson. The pair decided to try a new band using the Gearhead sound as a starting point and reinforcing the swing and roots influences. Their first full album was released in 2010 and titled Quiet Little Towns. In this release were all of the sounds blended into beautiful and detailed selections. There were country, swing, rock, blues and even gospel numbers and some songs combined all of these. The sound was taken further by Matthew’s polished vocal technique. Now sounding like a modern Roy Orbison/Dean Martin combo his vocals added a new Rat Pack element to the entire set. The band took to the stages at music festivals all over Florida and began to release a series of professional music and performance videos. After several lineup changes the band solidified in 2011 and has remained steady since. In 2013 the band released their second album titled American Ghost Stories. The album is an ingenious musical tribute to old time radio shows of the 1930’s, 40’s and 50’s and their style really compliments the storytelling of the lyrics. On this disk you will hear songs that are romance, detective drama, ghost stories and more. The band continued to play the festival circuit and shoot music videos for the next 18 months but in 2015 they stopped to dedicate time to their next album. Set to be released in early 2016 this third Bonazzoli Band album is sure to continue to improve upon their unique sound. The band is sticking to their slogan, “The best of 20th Century Music wrapped into a 21st Century alternative. Describe this new 21th century alternative sound? What inspired you to record and play this style of music? Matthew: Our slogan is that we combine the best of 20th Century music into a 21st Century alternative. What we mean by this is that we combine Rock, Country, Swing, Blues and even Gospel and Americana into a cohesive style that’s both new and familiar. It’s all our own and very few bands could duplicate it if they tried. We were inspired by our different influences. I’m a Rat Pack style crooner at heart. Patrick plays 1920’s ragtime and hot jazz. Damian as a classical and rock guitarist and Donnie, Reggie and Howie are classic rock fans going back to the 1960’s. We wanted to make something that we all would like ourselves and we would be proud to perform. We also wanted it to be a new sound but one which would also appeal to a broad base of music lovers. Like anything it took a while to get the sound just right. I first started building it in Massachusetts with my band Gearhead (1999 – 2004). In Gearhead my goal was to combine rock from the 1950’s through the 1990’s into one sound. We accomplished that and released two award winning albums. We had a look and a style that was really commercial but edgy. Once I moved to Florida I happened to meet ragtime pianist Patrick Thompson and I thought the swing and jazz style that he played would be a great addition to the sound. Once we started rehearsing with a full band it all started to gel. Ironically, a good many of the songs were what I had originally written for Gearhead’s third album which we never finished. So it was a gradual progression but it all came together in 2008. Tell us about your background and how The Bonazzoli Band came together? Matthew: I’ve personally been writing and performing since the mid 1980’s. Mostly rock but occasionally swing too. American Ghost Stories is actually my seventh album of original material. The current band came together after a chance meeting between Patrick and I at a business networking event. We had run each other several times and we would always talk about music. I told him about what I had going with Gearhead and he told me that he was a swing and ragtime pianist and we decided to see what would happen if we added more swing into the mix. After our first jam we knew we had what we wanted. In fact, it was Patrick who coined the mission statement “To Combine the Best of 20th Century Music”. We brought Damian into the mix once we had a lot of the material ready and that cemented the sound of our first release Quiet Little Towns. From there Donnie, Howard and Reggie came on board and the rest is history. When you're not writing music and performing, what do you guys like to do in your free time? Matthew: As much as I’d like to say the band was our full time gig we all have regular jobs so the band is our spare time. Damian actually runs his own music school as well and that takes an additional amount of his time. Reggie and Howie like to go around playing in various jam and pickup bands. Patrick is an attorney so he’s very busy with that. I handle the band’s video, marketing and recording work so it keeps me pretty busy. When you're on the road and touring, what is your favorite food you can all agree to eat and love? Matthew: Well, I think that would have to be Boston Market. If you could perform with any band/artist, living or dead, who would you choose to share the stage with? Matthew: Living would be Chris Isaak or maybe Brian Setzer orchestra. If anything were possible I guess I’d like to croon with the Rat Pack. I can’t really speak for the others but I’m sure they would not be the same choices I made. 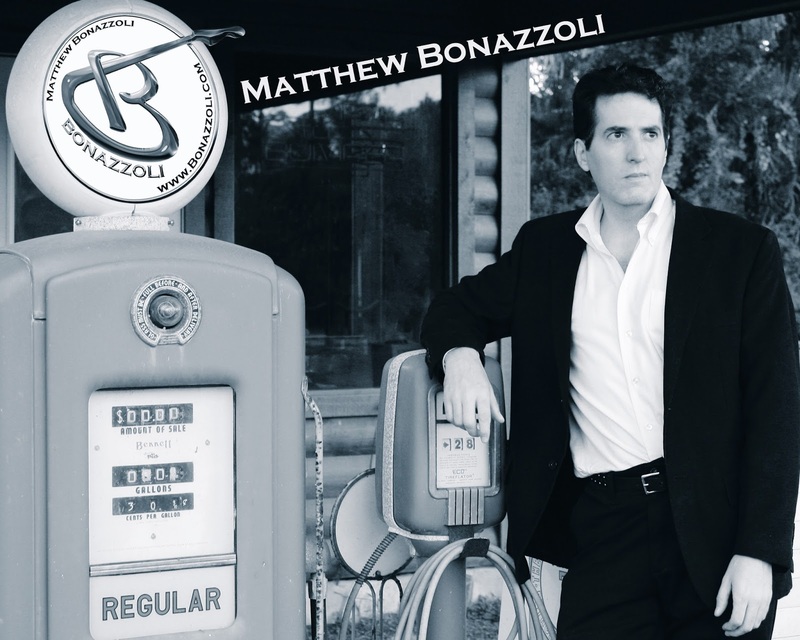 What song best represents The Bonazzoli Band? Matthew: If I have to choose I think the single Taking Chances. The truth is that our style varies enough from song to song that fans may disagree with me but I think that song captures it all. With Taking Chances you’ve got the Roy Orbison style vocals, smooth melodies, soaring guitar solos and melodic piano all coming together to make a great song. What is the main idea behind the album, American Ghost Stories? Matthew: The album plays like a musical tribute to old time radio shows from the 1930’s through the 1950’s. Patrick has an affinity for programs like The Inner Sanctum and Lights Out and others. We were on our way to a gig one day and he was playing one and the idea just sort of struck me as something that would fit well with our retro/modern sound. I could tweak a few songs that we already had and then write some new material based on the theme. The interesting thing is that going all the way back to my band Gearhead in the late 1990’s we always had a sort of haunted vibe going so it was an easy transition. You released your first album in 2010 and then again in 2013. What have you learned from the music industry and what is your strategy for your next album and what can fans expect it and how is it different from your previous work? Matthew: We’ve learned a lot. Our Quiet Little Towns album suffered from poor production in the recording studio we hired. For Ghost Stories I took over the recording process and we ended up with a great sounding album. I’ve also learned how difficult marketing is. As artists, we tend to focus on what we create but to continue that we have to expose people to our music. The internet is a great tool to use but there’s so much clutter it’s difficult to break through. The old adage that all publicity is good publicity still stands however so we try to get exposure anywhere we can. Regarding what’s to come with the next album, it’s going to be great. It’s actually about 80% finished and it’s some of the best stuff we’ve ever done. There will be a lot that’s familiar to our current fans and a lot of really amazing new music. Damian has taken a more active role in writing this time so there’s an edge to some of the new tracks that people are going to love. As to how it’s different, I can’t say. Our formula works well for us and our fans and it is really indicative of who we are as musicians so I wouldn’t want to tinker with it too much. That being said, the next album will be a follow-up to Ghost Stories in style but it will be less of a concept album and more of a traditional release. Unfortunately, I can’t share the title yet but it’s coming in 2016 so people will be hearing from us again very soon.